1.4 Composition of spinach per 100 gr. 1.5 Is spinach suitable for anaemia? 1.7 Who should not eat spinach? 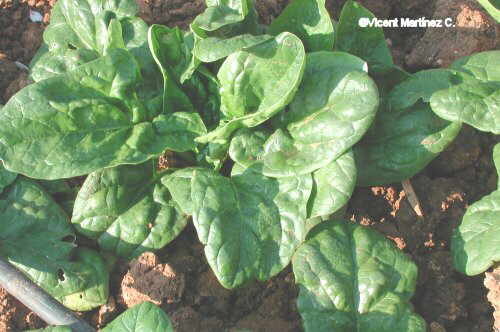 Spinach (Spinacia oleracea) was cultivated for the first time in China. In the XI century the Spanish merchants brought it form china to Spain. From there it expanded to the rest of Europe in the XV century. Three species of spinach exist, all they are cultivated as alimentary plants, well to eat their cooked mature leaves or, when they are tender, in salads. Spinach constitute some of the most renown anticancerous foods. It has been been proved that the ingestion of this food inhibits the appearance of cancerous tumors, especially lung cancer, so that those people who have the smoking habit should include this vegetable as a habitual food inside their diet. The reason of this property is in its wealth in beta-carotenes, superior to carrot, a plant that traditionally has been considered as the queen of this component. Beta- carotenes are precursors of vitamin A. It is a carotenoid, a sort of pigment that, once ingested, is transformed by the liver and the thin intestine in vitamin A. It is an antioxidant element that helps to prevent the formation of cancers, specially those ones that generally develop in our lungs, mouth and stomach. It has also been demonstrated that it prevents the appearance of heart illnesses. Also, since it transforms into vitamin A, it is an appropriate way to benefit of the properties of this vitamin, without the danger that an excess of this vitamin can suppose. A beta- carotene excess takes to a hypercarotenodermia state that is characterized by a yellowish coloration of the skin which is innocuous and it disappears without sequels when one stops to ingest rich foods in beta-carotenes. Among the main foods rich in this component we would mention the following ones: purslane (Portulaca oleracea L.), carrot (Daucus carota L), cress (Nasturtium officinale R. BR), borage (Borago officinalis L.), basil (Ocimum basilicum L.), pumpkin (Cucurbita pepo L.), tomato (Lycopersicon esculentum MILLER) coriander (Coriandrum sativum L.), asparagus (Asparagus officinalis L.), dandelion (Taraxacum officinale Weber) etc. besides beta- carotenes, its wealth in chlorophyll also contributes to enhance its anticancerous properties. 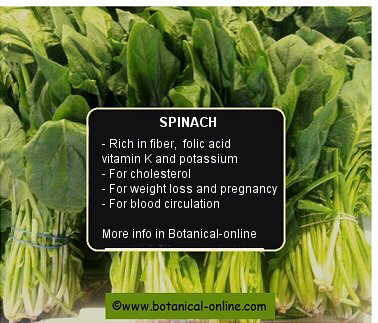 Spinach is also rich in vitamin K, which is necessary for blood clotting and for the maintenance of bone. Eating spinach can help make bones stronger and prevent injuries bleed for a long time or at least bruising blow. For its wealth of unsaturated acid, oleic, linoleic and alpha-linolenic, is well suited to the circulatory system for its ability to remove cholesterol and thinning arteries by preventing plaque formation in the arteries that are the cause of atherosclerosis. These same acids help lower blood pressure and prevent heart attacks. For its high content in water, superior to 92% and with 22 Kcal for each 100 gr (16 when it is boiled) it is very appropriate in diets to loose weight, provided that we combine it with the appropriate foods that don’t contribute with their caloric content. In this sense, the best way to take advantage of its properties is to eat it raw in salads, when tender, although it is necessary to make this almost everyday and with small doses, to avoid the accumulation of oxalic acid (See explanation below). It is easily digestible and rich in fibers, so it is very useful to avoid constipation. Also it has got vitamins A, B, C and E, potassium, calcium and phosphorous. Because its high content in zinc and folic acid (folate), it is very appropriate for pregnancy, considering that these elements are necessary so that the childbirth is carried out with normality. Zing, among other properties, intervenes in the formation of bones; folic acid prevents the defects in the neural tube, as bifid spine, The habitual ingestion of this food covers the needs of both, without having to appeal to supplements that, in the event of abuse, can be toxic. Besides, zinc is a mineral very related with pregnancy, since its deficiency causes the sperm to possess few spermatozoids. Composition of spinach per 100 gr. Is spinach suitable for anaemia? It is a plant rich in iron, so that it is very appropriate to combat anemia. With regard to this topic, we must comment that the legend of ” Popeye ” is only partially true, since spinach, although rich in this element, is not the plant with the highest quantity. Among these there are other vegetables, as eggplants, (Solanum melongena L.) beans (Phaseolus) and cereals, as oat (Avena sativa L.), beside many other herbs, from whom we can get the iron by means of infusions. The richest plant in iron is dandelion (Taraxacum officinale), which we can eat fresh in salads like a vegetable or through infusions. On this topic a strong discussion exists, because some dieticians believe that the oxalic acids that spinach contain impedes the absorption of this mineral, consequently its consumption doesn’t have any impact in the treatment of anaemia. Who should not eat spinach? In spite of the many virtues of this food, people affected from rheumatic or kidney illnesses should abstain from eating it . As a matter of fact, it is not very reasonable to consume it in excess even without presenting these symptoms. Its wealth in oxalic acid that combines with other minerals such as magnesium, potassium and iron, produces oxalates. They precipitate in the articulations as little cutting glasses damaging the articulation tissues, or worsening the symptoms of some illnesses as gout, rheumatism, arthritis, etc. Moreover, oxalates can produce kidney stones or gallstones so that this plant is not advisable for those people who suffer or have suffered renal or biliary problems, for those suffering from arthritis or for liver disease diet. Also, an exaggerated consumption of plants rich in oxalates, can impede the absorption of other minerals necessary for health, especially calcium. So, although spinach is one of the plants with greatest content in calcium, it is not an advisable option to avoid osteoporosis. A way to avoid the absorption of most of oxalic acid is to eat it boiled, changing the water a couple of times before serving it. This is the way to eliminate part of the acid it contains.